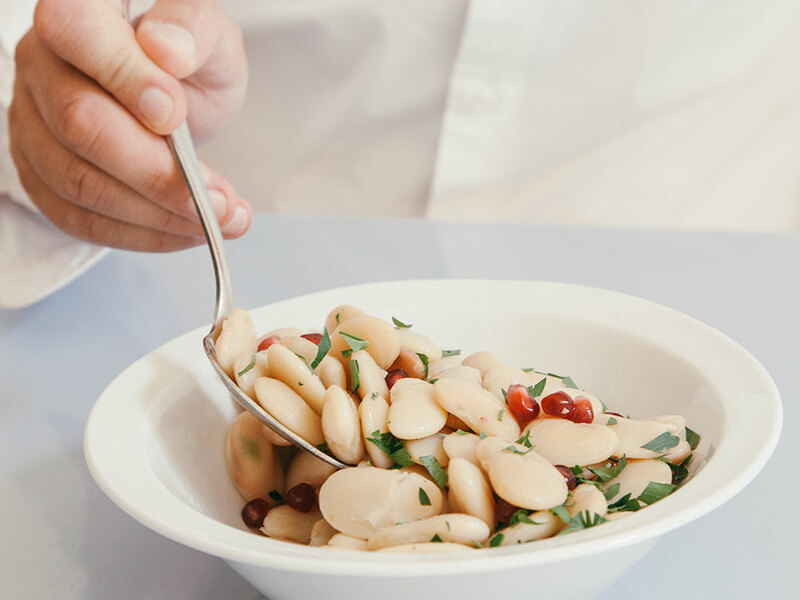 Fassolia (from the Latin faseolus) means “beans” and aa’rida means “large,” so this recipe refers to flat, large white beans that grow on a vine that covers big parts of the garden. A single plant grows indefinitely. The beans are picked green in August, and are tender and fast-cooking. Tender fassolia aa’rida is a delicacy that needs short cooking over a low fire, and gives plump, pearl white, melting beans, that are best served warm with a drizzle of lemon and olive oil . . . they are not called butter beans for nothing! Salt should never be added to the cooking water for beans, as it will toughen the beans and they will not cook well. Boil the beans in enough water to cover over low heat until softened and cooked through. Cut the fire a little before the beans are completely soft, as they will continue to cook in the liquid. Drain the warm, soft beans. Crush the garlic together with a pinch of salt, add the lemon juice, olive oil, and more salt to taste, and drizzle the dressing over the beans. Sprinkle the parsley leaves over the beans and serve warm.